With just one game left in the college football season, it’s time to turn more of our attention to the hardwood. Last night, the top two teams in the country (as of now) battled at Allen Fieldhouse and it did not disappoint. Every week for the rest of the season, “Schoolyard Ball” will attempt to take a look at some of the big games, teams and players around the NCAA. We will have three segments each week centered around some of our old playground favorites growing up: Around the World will just do a sweeping look at some of the top teams around the country, H-O-R-S-E will lose the letters to spell out some discussion topics for the week, and Twenty-one will be 21 random thoughts for the week. Note: I decided to postpone the “Around the World” section back a week until I can watch a few more games and get a little bit better feel for who I like around the country. 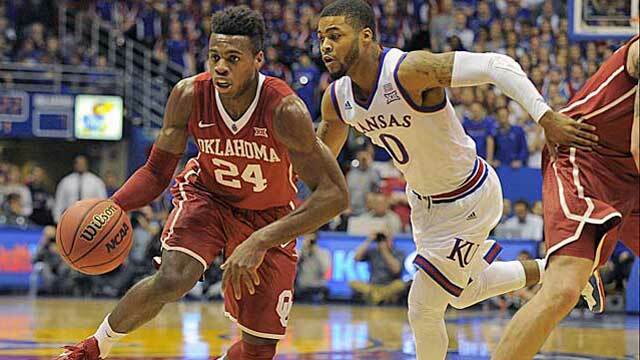 No offense to guys like Ben Simmons and Kris Dunn, but Buddy Hield is the biggest star in college basketball this season. Simmons is probably going to be the number one pick, and any of these three guys may end up winning the Naismith Award. However, no one is more exciting, has more “in” hair or has the swagger that Hield shows on a nightly basis. Sorry to go back-to-back on the Sooners here, but they just happen to be fresh on the mind. Oklahoma may be the best team in the country, but that also doesn’t necessarily mean they are, or should be, the favorite to win the tournament. Their up-tempo, shoot tons of threes style of play is so much fun to watch and suits their roster, but it isn’t necessarily the type of play that ends up winning the tournament. Things to worry about with them are interior defense and creating offense when the shots aren’t falling. Khadeem Lattin is a good shot blocker and Ryan Spangler is a solid forward on both ends, but too many times last night the Sooners gave up easy baskets and second chance opportunities and that usually leads to losses when it happens in big games. As for the latter point, teams that rely heavily on outside shooting are at a disadvantage in the tournament atmosphere where they are playing in unfamiliar arenas and if the path leads to a title game that’s three different arenas in three weeks, and no home games. That makes things more difficult for teams like OU, but it isn’t impossible just look at last year’s champion for your proof. Admittedly the Perry Ellis “Redemption Story” is a little embellished, but who doesn’t love a great tale? Perry Ellis has had a good career at Kansas, but coming into this season he was largely known for two things: failing to live up to his McDonald’s and Parade All-American expectations and seemingly being at Kansas for 20 years. Part of that is the fact that he looks like he’s twenty years older than he actually is (he turned 22 last September), but not in the Greg Oden exceptionally physically mature way, more like a “wait Prince William is only 33?” way. The other part is that he has been getting legitimate minutes for four years now, a mahamanvantara in today’s college basketball. The two ways to look at that statement are: well he’s been good enough to stay in the lineup for four years, and yeah but why hasn’t he gone pro yet if he’s that good? It turns out that coming back was smart, because he is undoubtedly better now than he was last year, and while he may never be a lottery pick there’s a decent chance he moves from a second round pick to somewhere in the late first round. The reduction of the shot clock to 30 seconds was a great rule change for college basketball on every level. It’s more exciting for the fans. It’s better for the players wanting to go pro, because miming the professional style of play and rules as closely as possible can’t possibly be a detriment right? It creates a faster game with more possessions and more opportunities as well. The NCAA doesn’t always get things right, but they did here. Confession time: my focus has been predominantly on the college football season over the last month and a half and, regrettably, I have neglected college basketball. That was a mistake because college basketball is fantastic. Sure it gets sloppy sometimes, and for the people who want to call it a “diluted product” because of the one-and-done rule I’m not here to refute you. In fact, I agree with you. However, this is what we’ve got and it’s still a ton of fun. The energy of the crowd and the excitement of the most unpredictable sport to grace major American network program are worth watching…diluted or not. 20. Is three point shooting finally starting to improve in college basketball or is the defense just worse? 19. Not to harp on defense, but the days of team’s running a zone defense 90% of the time are numbered. 18. That wasn’t meant to be a barb at anyone in particular, not even Jim Boeheim. 16. 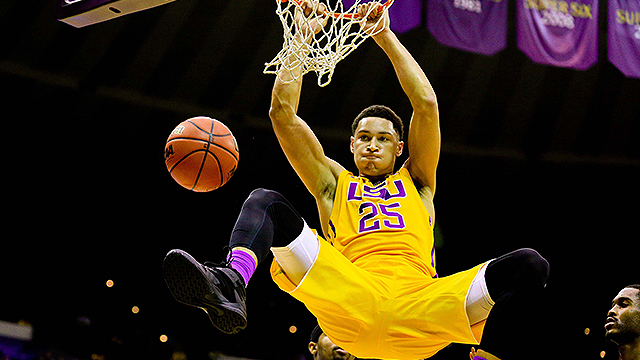 Get ready for Ben Simmons tonight. 15. Simmons vs. UK is easily the SEC matchup of the year. 14. Where you at Pac-12? 13. I see you Arizona, but seriously just one? 11. They still deserve to be ranked there for now. 10. I’ll always believe Villanova and Virginia are better than they are. 9. Virginia isn’t “killing” college basketball. 8. They just do it differently than you. 7. “X” marks the spot, and by that I mean Xavier will make another tourney run. 6. Brice Johnson is an animal, or was on Monday. 5. North Carolina isn’t trust worthy. 4. Marcus Paige playing off the ball doesn’t feel right. 3. What do I know though, I thought their football team would go 4-8. 1. This was fun I’ll talk to you guys next week.